Boomer (P2) has all the skills of an experienced Colonial combat pilot and officer. The Boomer model has the ability to interface directly with human computer systems and read/write data at terrific speeds. 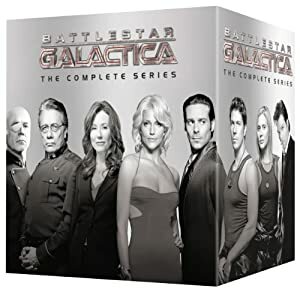 If Boomer (P2), or any Boomer is killed and they are within a few light years of a resurrection ship or a Cylon home world they will be reincarnated if it suits the super-consciousness and the needs of the Cylon nation. All Cylon models, Including Boomer, have a weakness to an unspecified frequency of energy that is found naturally occurring in the Rangar systems. While in a system where this energy is radiant, or exposed to it directly, the Cylon loses the ability to transfer consciousness and grows ill and eventually dies. Boomer (P1) was a deep cover operative before the Apocalypse. She made friends with the Galactica crew and became accepted there. She also became Chief Tyrol’s secret lover. In the First days of the war she and Helo, her navigator, rescued a load of survivors from Caprica. Helo stayed so there would be a space for Baltar. P1, under compulsions she was unaware of, sabotaged Galactica. 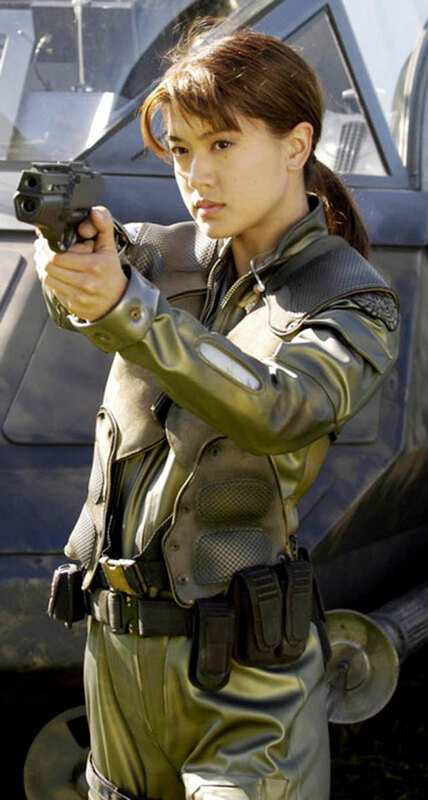 She was also fighting the Cylons, even nuking a base star of her own clone sisters on one occasion. Boomer (P1) shot Cmdr Adama under coercion and seemed to be unaware she was doing it. She was held captive and interrogated for a short time, but gave up little information before being killed by Cpl Cally in revenge to what she had done to the chief. 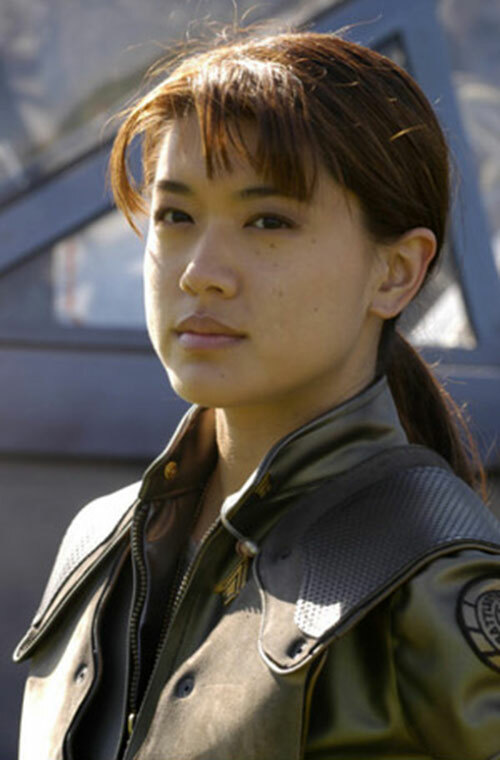 Boomer (P2) appeared on Caprica to Helo representing that she was (P1). She was stuck with him on the Cylon occupied world. The two formed a romantic relationship over a period of months in the resistance together. Helo learned she was a Cylon in time for Starbuck to arrive on Caprica. Boomer (P2) rescued the colonial officer (apparently against orders) and returned them to Galactica. Boomer (P2) was taken prisoner upon her arrival, both as a Cylon and for the crimes of (P1). Just as she started to gain the trust of Cmdr Adama and the Galactica’s crew the Battlestar Pegasus arrived, polarizing the issue again. Boomer is a Polynesian woman in her mid 20s. She tends to wear Colonial Uniforms or some derivative thereof. Boomer (P) is Sandra Bullock-like in her girl-next-door good looks. Boomer (P1) was unaware that she was a Cylon under deep cover for much of her career. During this phase she was a dedicated pilot of the Colonial Defense force. She was also Chief Tyrol’s secret lover. After she learned she was a Cylon deep cover agent she was thrown into a real identity crisis. Even when she was executing her hidden directives (stealing and setting explosives and shooting Adama) she tried her best to stay loyal. Boomer (P1) was heartbroken when the chief rejected her after her exposure. It is worthy of note that extreme emotional stress allowed her to access some of her stored data. Boomer (P2) was designed to be the same person as P1 but was aware of her Cylon nature. 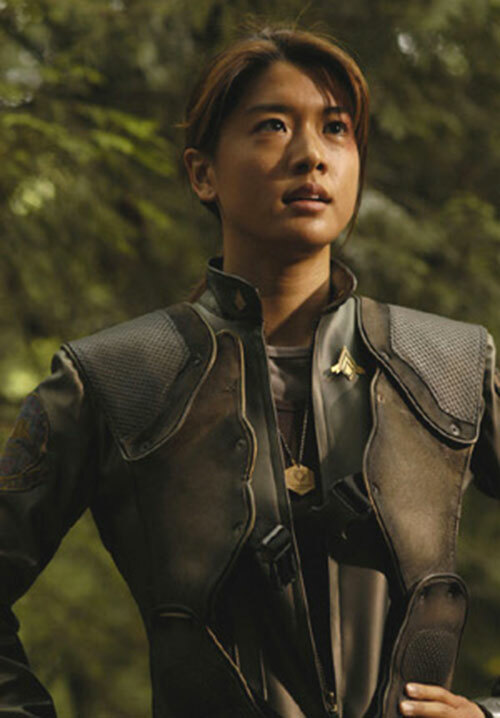 When she became pregnant (apparently) her loyalties shifted to the colonials from the Cylons. Boomer (P2) loved both men having P1’s memories. Later Boomer (P2) became a kind of hybrid of Cylon knowledge and skills and her human personality. There are many Number Boomers, potentially billions. Each when decanted has access to the knowledge of all the Boomers but it does not update as time goes by. When a Boomer is decanted she can have any conceivable skill at her Link (L) attribute level. Unlike the Number 6, the Boomer designed as a general use infiltration model. The Sharon model has also shown the ability to interface with computers and read binary for meaningful data. With a fiber connection jammed into a cut in her hand she proved to be able to write viral code with blinding speed. Boomer (P1): The First Boomer Cylon (Deceased) was designed to play the same role in a parallel timeframe. Her stats should be considered identical. Boomer (P2) seems to have a full asset of P1’s memories. Dex: 05 Str: 03 Bod: 04 Motivation: ??? Personality Transfer only Works with the “Boomer” super consciousness. Telepathy has No Range and requires physically inserting a data connecter in an open wound. Formerly Cylon Nation (High); Chief Tyrol (High); Helo (High). Secret Identity; Fatal Vulnerability (Rangar Energies); Loss Vulnerability (Personally Transfer to Rangar energies). Both Vulnerabilities have a range of 29. Raptor, Auto Pistol (See Galactica Weapons Locker). Helper(s): http://scifi.com/battlestar/characters , Roy Cowan, Sébastien Andrivet.